I recently had the good fortune to go on a guided pheasant hunt with my dad, a life-long friend and a bunch of other really good guys. One of those guys documented the three-day trip with his camera. Everywhere we went, into the field and back in the lodge, he took candid shots. I noticed the camera pointed at me several times, and was anxious to see the results, until I did. Self-perception is an odd thing, and it’s difficult to do correctly. Most of us are far too critical about how we appear. Others, like me, are somewhat delusional about how we appear. A rare few are actually accurate in their perception of how others see them. Walking around with a severe limp and a droopy right eye for most of my life, I have learned not to worry about how others see me. Though I’m somewhat aware of them, I choose not to acknowledge negative perceptions. That’s relatively easy to do when you are away from the camera and surrounded by familiar people. Even the mirror, though it does not lie, can be fooled with a careful pose. The candid camera cannot. So, there I was, crooked leg, bald head and droopy eye, with my dad helping me carry my plate from the buffet line. I remember the moment and the camera to my side. I wasn’t bothered by it then, but I was when I first saw the picture. The insecurities that I had carefully tucked out of sight escaped and bopped me in the back of the head. Insecurities haunt all of us, at least occasionally – even powerful and famous people. President Franklin Roosevelt consciously hid his disability from the American public throughout his twelve years as President of the United States. He wasn’t ashamed of his disability; he just didn’t want to be judged by it or to have critics see it as a weakness, so when cameras were present, he was careful to keep his wheelchair out of the photo. It’s OK to minimize your vulnerabilities in order to craft the image you want to project. We should try to look and act our best. Like it or not, friends and strangers alike respond to our image. What’s not OK is to let the things you can’t control about your image bring you down, and that’s what I did. I focused on my weaknesses while completely ignoring my strengths. I prioritized what I’d like to change over what I value. I held myself to an ideal that is beyond my reach. What’s more, I did all of this without any outside prompting. No one on the trip treated me any differently. Who isn’t guilty of this, at least occasionally? Maybe it’s not our physical appearance, but a perceived shortcoming of intelligence or achievement that makes us feel inferior. Maybe we don’t invite friends to our homes, because we feel that our homes don’t compare to theirs. None of that matters. What matters is how we see ourselves. My parents taught me that lesson in my pre-teen years, when it became obvious that my disability was going to affect my future. They encouraged me to value and capitalize on my blessings, and they wouldn’t let me feel sorry for myself. My friends, teachers and others around me reinforced that credo, which allowed me to create a cocoon around myself in my teenage years. I’ve been able to move that cocoon with me through the different phases of my 48 years: college, young career, fatherhood and to where I am now. Very rarely does something penetrate the cocoon, but that picture did. Fortunately, I was able to quickly recover by stepping back and taking a larger view – a view in which my gratitude squashed my insecurities. That was easy to do as I looked through the other pictures. 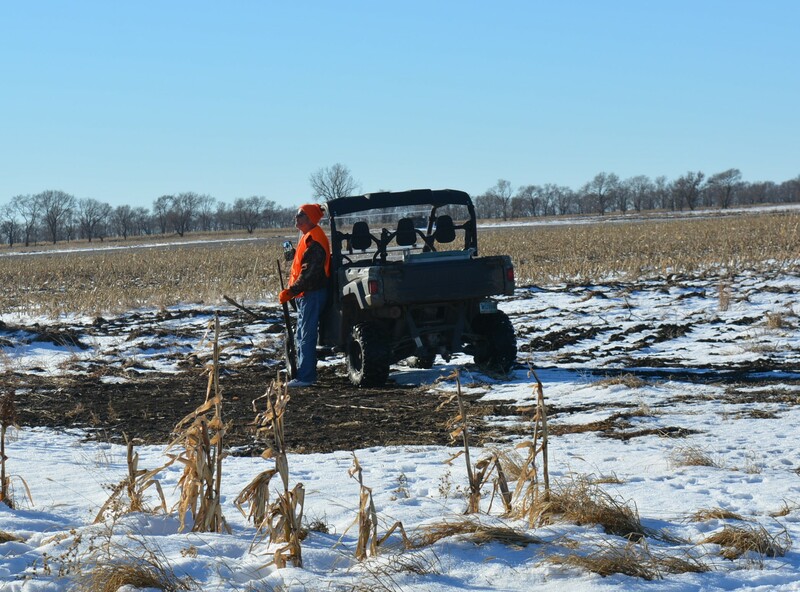 We had been blessed with great weather, which isn’t a given in late December in South Dakota. If the weather had been different, I likely wouldn’t have been able to participate in the hunt. Furthermore, our outfitter was extremely accommodating of my limited mobility, letting me use a UTV to get around. Last, but certainly not least, I was able to have a great time with a great group of new friends. It would have been really difficult to improve the experience. It’s amazing how blinded we can become by our insecurities. Most of the time, when they obscure our blessings, we need only take a short step to the side and look more closely. Those blessings are usually right there in front of us. Before I met one of my wife’s best friends more than twenty years ago, she was concerned that I wouldn’t be able to climb the stairs to her second-floor apartment. I later learned that she thought I was confined to a wheelchair, because Lynda had oversold my physical limitations when she had called earlier in the week. When I walked through the apartment door, I could see the relief and pleasant surprise in her friend’s face. I’ve always relished surprising people with what I can do. Unfortunately, it doesn’t happen as often these days. Now, it’s more common for me to see concern and pity, particularly when I take my wheelchair for a spin and encounter someone I haven’t seen in a while. This is one of the biggest reasons I resisted buying the wheelchair and continue to resist using it. I want to remain the guy who beats the odds and surprises people, not the poor guy in the wheelchair being pushed by his wife. Now that it’s football season, I pretty much use my wheelchair every Friday night, which means that I’m being pushed around in front of our community – our friends, our children’s friends and their parents. That’s pretty humbling, and I find myself wanting to wear a sign that says, “I’m riding now, but be in my gym at 8 am tomorrow morning to see me walk unassisted and push heavy weights.” Unfortunately, it’s more likely that the image of me in the chair will be what these people take home with them. A few weeks ago, in the week before his first varsity football game, my son developed a large, ugly blister on his forehead near his hairline. It was likely caused by irritation from his football helmet. Whatever the cause, it caused him much anguish, as he worried about how others viewed him. As a guy who battled acne as a teenager, I could empathize, and I wanted to do everything I could to remove this challenge for him, but I couldn’t. All I could do was offer advice. I told him that, in the grand scheme of things, the blister was but a minor, temporary inconvenience. School was going well. He had earned a starting spot for his first varsity football game, and he was enjoying a blossoming relationship with a nice young lady. Don’t let something so small as a blister rob that happiness from you, I told him, which turned out to be great advice for me too. Most people are more supportive and understanding than we believe them to be. Their reactions might be instinctual, but the people who really matter see through whatever external flaws we fret over. In fact, I think we worry much too much about small things that we mistakenly think matter to others, and all of this worry sabotages our happiness. Whether it is a wheelchair, blister or some other challenge, make sure that you put whatever is worrying you in its proper place, which is usually at the bottom of the Stuff that Matters list. Doing this will help you properly appreciate the blessings around you. I’ve been qualified for a handicapped parking placard for as long as I’ve been able to drive, but I drove for nearly 20 years before I got one. During that time, I’ve watched people with far less challenging disabilities than mine use them, and I’ve heard people with no disability at all boast about using them to get a better parking place. I’ve limped past both. Friends who went to NASCAR races with me admonished my stubbornness. “Why the hell do we have to park way out here?” they asked. “Because he’s too stubborn to get a handicapped placard,” my wife would answer for me. I resisted the handicapped placard, because I didn’t see myself as handicapped. Sure, if I paid attention to such things, I would have noticed the obvious, but no one really treated me any differently, so I wasn’t forced to acknowledge the obvious. Ironically, I convinced myself that parking in one of those reserved stalls would alert the world that I had a handicap, as I limped by. Such is the power of self-image. Obviously, my self-image was overly optimistic, but far too often, self-image is overly pessimistic. We see ourselves as failing before we even try. We feel inferior to others, though we’ve never really looked for our own worth. We become our own worst enemy, because we let doubt and negativity cloud our thinking. I believe that we often develop negative self-images when we focus on our weaknesses and past failures instead of our strengths and potential. Everyone makes mistakes and has weaknesses. We doom ourselves to negative self-images if we fail to realize that failure and weakness are parts of being normal, and that we need to learn from our past and put it away, while focusing on our strengths and potential. So, how do we optimize and nurture our self-image? Feed strengths and starve weaknesses. We often give our weaknesses more attention than they deserve. Sometimes, we even focus on them, to the detriment of our strengths. Discover what you are good at and do more of it. Blend humility with appreciation. A healthy dose of appreciation puts weaknesses where they belong – out of the spotlight. When you are feeling down, take the time to be thankful for your blessings. This isn’t always easy, but it’s almost always necessary. Associate with positive people. We all have those people who leave us feeling refreshed. They refuse to let us wallow in self-pity and help us direct our thoughts to positive areas. Spend more time with them and less time with the whiners and those who encourage whining. Eliminate negative self-talk. Most of us have a silent, but active internal dialogue that we’re often only faintly aware of. Stop and think about it. What are you telling yourself about yourself? If our self-talk repeatedly tells us that we are unworthy of success and happiness, we start to believe it. If there were a little creature sitting on your shoulder constantly criticizing everything you did, you would smash him within minutes. Why let him live inside your head? I use the heck out of that handicapped parking placard now, not because my self-image surrendered, but rather because it became stronger. Now, I could give a rat’s rear-end about what judgments people might make about the way I walk or where I park. I owe that attitude to a positive self-image that I’m careful to nurture, and I hope the same for you.